The newest technology available for periodontal patient care, the Nd:YAG Millennium PerioLase®, is now available at our office. Like LASIK surgery for the eyes, this patented and FDA-approved laser therapy allows us to treat periodontal patients with a minimally invasive, breakthrough procedure which, in many cases, eliminates the need for conventional periodontal surgery. The Millennium PerioLase® was developed specifically to treat periodontal disease using LANAP (Laser Assisted New Attachment Procedure). 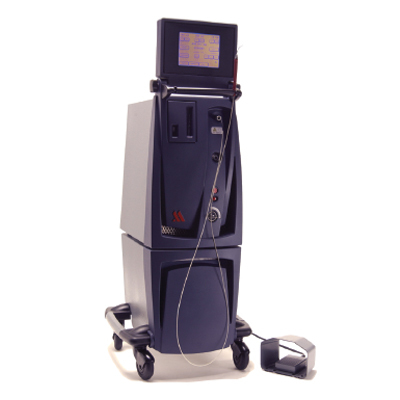 The FDA-Approved and patented LANAP laser therapy is a pocket reduction protocol that reduces gum pockets caused by bone loss around the teeth By establishing a new attachment (seal) of the gum tissues, the LANAP procedure provides the ideal environment for the regrowth of bone and the ligament attachment to a root surfaces that was diseased before treatment began. This is a minimally invasive periodontal procedure like no other. In most instances, treatment with the Millennium PerioLase® eliminates the need for conventional cut and suture periodontal surgery, also referred to as flap and osseous surgery. Approved by the Food and Drug Administration in 2004, this pulsing laser can distinguish between healthy and diseased gums by color. The infected tissue, which has a darker pigment than healthy tissue and bacteria are "zapped" away by the laser, leaving behind only healthy gum tissue. LANAP then helps connective tissue and bone form between the gums and teeth, according to a study in the December 2007 issue of the International Journal of Periodontics and Restorative Dentistry. The laser's heat also seals the gums with a "thermal blood clot" which creates a physical barrier, blocking any bacteria or tissue that could recreate a gum pocket. For patients who are concerned about traditional cut and suture surgery to treat periodontal disease, the new laser treatment can be a life-changing event! Teeth can be saved, natural smiles can be preserved and some potentially life-threatening systemic effects of bacteria from gum disease left untreated can be avoided. Laser treatment gives patients a new option. For more information on the LANAP procedure click here.